The Chrysler Museum of Art in Norfolk, VA is offering an exciting new dynamic duo – everybody’s favorite ceramic/glass artist Christina Bothwell and our own Professor Pangloss (Panglass?) Tim Tate. The five day workshop runs from May 30 thru June 3. Take advantage of a rare opportunity to learn from two working studio artists that have much to share. Discover the techniques and influences behind the works of Christina Bothwell and Tim Tate, both former winners of the Virginia A. Groot Foundation Award for Sculpture. 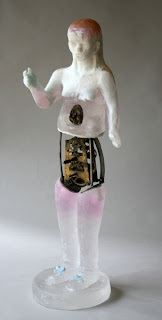 Bothwell’s work often combines clay and lost wax casting in a figural narrative, while Tate’s art focuses heavily on mixed-media electronics and lost wax casting. Demos will include lost wax casting, open face molds, and casting voids in artwork. Students, whether beginners or experienced glass artists, will have time to work in the Studio, but will benefit most from the group discussions of each student’s work and how to advance to another level in expressing their creativity in glass. Click HERE to jump to the Chrysler Museum’s site for more info about their workshops. 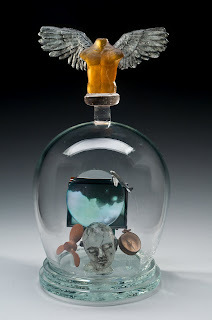 This entry was posted in christina bothwell, chrysler museum, Tim Tate by Michael Janis. Bookmark the permalink.